Our doves are very important to us. Please read our conditions below before making a booking. Inclement Weather : We cannot release our doves in bad weather conditions such as heavy rain, snow, fog or strong winds as they cannot navigate safely. If we have to cancel a release due to bad weather a full refund will be given. Cancellation by you: There will be no refund of any monies paid should you decide to cancel your booking. We are flexible up to half an hour from the time you state the release will take place. A fee of £10 per half an hour will be charged in cash to the dove handler on the day for any excess delay after this. However, as above, if the delay results in insufficient time for the doves to fly home before dusk then the release will be cancelled and no refund will be given as we would have worked out timings on booking. 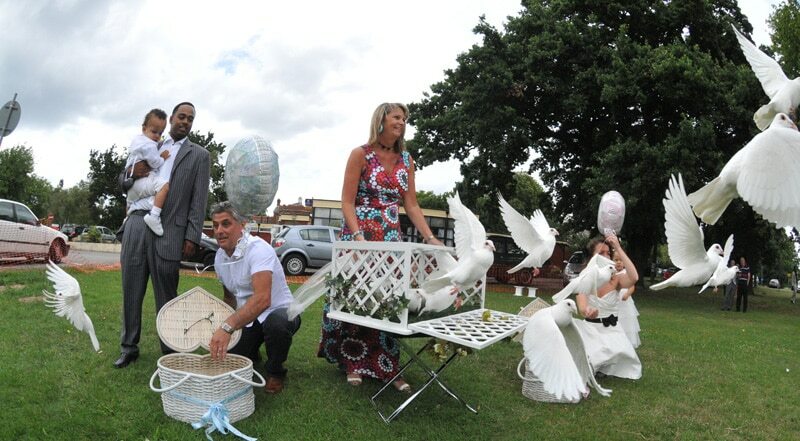 Our Doves : the birds are fed a special diet before the event. It’s very unlikely that they will do their droppings during a release. In case of an accident we cannot be held responsible, although this has never happed yet. The birds MUST NOT be released indoors or at night time. A non-refundable £25 deposit will secure your booking; the balance will be due four weeks prior if paying by cheque and one week prior if paying by bank deposit. An experienced dove handler will be present at all times to co-ordinate the dove release. Finally, you can be assured that you will receive a first class professional service from our Company, you only have to read our testimonial page.